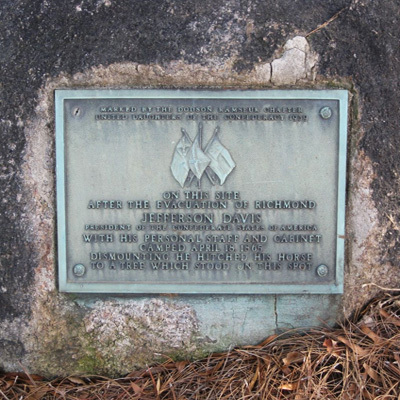 The Jefferson Davis Camp marker consists of a rectangular bronze tablet attached to a large, low to the ground, rounded boulder. In relief in the center of the tablet are three flags, the Confederate battle flag, the North Carolina State flag of the Confederacy and the national flag of the Confederacy. Although the tablet is dated 1939, news reports have the dedication as June 1941. Overgrown and ignored the area around the marker was properly landscaped and then rededicated in 2012. ON THIS SITE / AFTER THE EVACUATION OF RICHMOND / JEFFERSON DAVIS / PRESIDENT OF THE CONFEDERATE STATES OF AMERICA / WITH HIS PERSONAL STAFF AND CABINET / CAMPED APRIL 18, 1865. / DISMOUNTING HE HITCHED HIS HORSE / TO A TREE WHICH STOOD ON THIS SPOT. After Richmond fell on April 3, 1865, Jefferson Davis, President of the Confederate States of America, and his advisors fled the city on the railroad headed south, eventually spending 15 days in North Carolina. In route from Greensboro to Charlotte, the party spent the night of April 18 in Concord at the home of Confederate sympathizer Judge Victor C. Barringer on North Union Street. The marker is on Earl Ave NE just north of Church Street in Concord, NC. It is on the right when traveling north from Church Street. The marker rests next to a utility pole between a used car lot and former single family dwelling now used for a business. Industrial buildings are across the street.